Holy flying purple birds! The Ravens jumped into the truncated NFL offseason with both feet on Monday evening, making nearly an entire typical offseason’s worth of moves in a single night. In a day that many in Baltimore will forever remember as “Black Monday,” the Ravens cut ties with some old beloved favorites, reminding us all once again – as if we’d forgotten after 130+ days of labor negotiations – that the NFL is a business first and foremost. Long-time Ravens Todd Heap (with the team since 2001), Kelly Gregg (2001), Derrick Mason (2005), and Willis McGahee (2007) were informed by Ozzie Newsome of their respective releases on Monday. The cuts came as a shock to many of the purple & black faithful, as these names account for a significant percentage of the jerseys you’d see scattered across M&T Bank Stadium on any given Sunday over the past 5-10 years. There is no room for sentimentality as the NFL returns to the salary cap era after the “Wild West” uncapped 2010 season, and many Ravens fans find themselves having a hard time dealing with some of these latest roster moves. A sampling of the reactions on Facebook and Twitter finds a great number of fans questioning Ozzie, expressing sadness like they’ve lost a loved one, and even wishing the lockout was still on. While I can relate to the emotion – trust me, I can – everyone needs to take a deep breath and just RELAX for a few minutes. The compressed timing of all of these moves – all were announced within about a two hour period – certainly added to the feeling of overwhelm and grief that so many of you are feeling. In a typical offseason, we’d have had weeks or even months to deal with these cuts as they came individually over a much, much longer span of time. Losing those four guys, who have contributed so much to our team over the years, in one fell swoop, is indeed a lot to handle. First off, reports are that the team will try to bring back Mason and Heap at lower cap numbers. Secondly, Ozzie knows what he is doing. The Ravens were, by all indications, the most active team on Monday. There is no question that there is a hard blueprint in place at the Castle for exactly what needs to be done, and that blueprint is being executed. The team’s priorities are resigning guard/tackle Marshal Yanda, signing Haloti Ngata to a long-term contract, and getting some pass rush help – all priorities that had no prayer with the team bumping up against the salary cap before this purge. Reports were swirling Monday (prior to the cuts) that the Ravens were already being priced out of the Yanda sweepstakes, with the deep-pocketed Washington Redskins champing at the bit to get to the big farm boy. Suddenly, seeing #73 on September 11 isn’t nearly as far-fetched of a proposition as it was just a few hours ago. The Ravens now have the room that they need to at least sit at the table with Yanda and his agent and offer a market-worthy deal. Whether or not Marshal stays obviously remains to be seen. But again, we have a better chance now than we did with all of those costly veterans on the roster. In addition to Yanda, the Ravens can now think about pursuing some other free agents, such as Minnesota Vikings defensive end Ray Edwards, New York Giants DE Mathias Kiwanuka, or Tennessee Titans DE Justin Babin. Some names of wide receivers have been floating around as well, including former Viking Sidney Rice and potential cut victim Carolina Panther Steve Smith. The team says that they informed quarterback Joe Flacco of the impending cuts of Heap and Mason prior to the news breaking, so as to not catch him off guard. Probably a good idea, considering the QB is likely breathing heavily into a paper bag as we speak, facing the prospect of having lost his top two security valves in the offense. Joe, like the thousands of fans with Mason and Heap jerseys, will need to adjust quickly. Some are dreaming that the Ravens are cutting costs in order to pursue a full-court press on Oakland Raiders cornerback Nnamdi Asomugha, but I just don’t see that happening. He’ll still cost too much. Unless they lose just about everybody else they hope to resign, including Yanda and others. Now, it wasn’t all gloom and doom on Monday. The Ravens were also active in signing some undrafted free agents – again, Ozzie has a plan. First up was former Boston College Linebacker Mark Herzlich. Herzlich deserves a post all to himself, but for now you’ll remember him as the BC linebacker who won ACC Defensive Player of the Year in 2008, then was diagnosed with cancer and missed the entire 2009 season. Now cancer-free, Herzlich could be lining up next to Ray Lewis this fall. EDIT: Despite reports last night, Herzlich apparently shunned the Ravens for the Giants. His bad. Next, the Ravens inked former Miami Hurricane running back Damien Berry to a deal. Depending on if the team goes out and signs any of the free agent running backs (Ricky Williams, Ronnie Brown, Reggie Bush, etc. ), Berry will likely be competing with Jalen Parmele and seventh-round draft pick Anthony Allen for a special teams spot along with being the junk time runner. Based on that video, the kid has some talent, but we have to remember that there’s a reason he wasn’t drafted. It’s a lot to deal with in one day, I understand. One thing to keep in mind though, is that it’s better to get rid of players a year or two “early” than a year or two “late.” As much as we hate to admit it, there is a very successful franchise about four hours to our northwest who has made a habit of doing exactly that (swapping an aging, expensive Joey Porter for a young up-and-coming LaMarr Woodley, perhaps?). 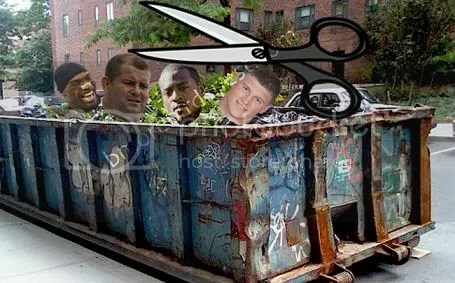 Of course, there’s the possibility that all of these roster moves are just an elaborate ruse to trick former defensive coordinator Rex Ryan into cutting half of his team as he falls all over himself to sign each and every Raven that was cut today. Rex, as we all remember, is constructing Ravens-lite up there in New York, and he’ll surely be after the services of Gregg and likely Heap at the very least. There will undoubtedly be more moves on the way, Ravens fans, so if you’re one of those who feel like they had to say goodbye to some old friends yesterday, steel yourselves now. Guys like Dominique Foxworth, Brendon Ayanbedejo, and other vets will be looking over their shoulders constantly in the upcoming hours and days. Welcome back, football. We’ve missed you. This entry was posted on July 26, 2011 at 8:49 am and is filed under News, Ravens. You can follow any responses to this entry through the RSS 2.0 feed. You can skip to the end and leave a response. Pinging is currently not allowed. I demand an immediate edit to this article! Herzlich signed with the Giants. Come on we need some ppl guys we can’t keep up with the rest of these teams with old players that nobody wants go out there and get a plaxico burress or a Nanmdi asoughma we need new good players season has started guys … GET GOING!!!!!!!! It appears that despite chopping the four vets, after the Yanda deal the Ravens are handcuffed by cap space until they can reach a long term deal with Ngata. Don’t expect much of anything until that happens. Plaxico fits into the “old guys nobody wants” category, I think. I’d rather have Mason back – which I still think is pretty likely. Nnamdi is not happening. Not unless they cut about 5 more veterans like Reed, Suggs, Boldin, etc. There will be guys available next week. Remember, “right player, right price.” They picked up Josh WIlson out of nowhere last year extremely late. I’m nowhere near panic mode.